Kristie – In my eating disorder I had a complete and total addiction to checking the size of my stomach. I would check in front of the mirror, with my hands, or just by looking down at my body. Once, in a single hour I tallied myself ‘checking’ over fifty times!. You don’t have to give up body checking. No one can make you. If you choose to hang onto it as your ‘safety behavior’, I can promise you that living with a little bit of an eating disorder is no different to living with a full blown eating disorder. Trust me. I tried it for over a decade. Turns out, you are still in a cage. 3. Choose where to start. Body checking is an endless cycle. It is a game you can't win - and if you think you've 'won', it will turn out the sacrifice isn't worth the reward. So, do you want to tackle the mirrors? The scale? The sneaky pinching of your hips or stomach? It doesn’t matter WHERE you start. It does matter THAT you start. I have left off here deliberately – I want you to spend the next little while being aware of all the sneaky ways body checking weasels itself into your life. Awareness is a powerful thing. 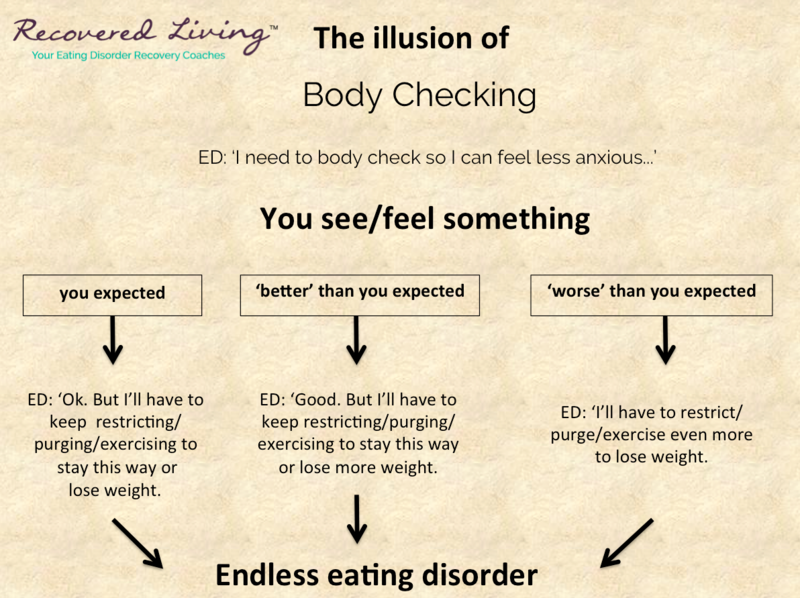 In the next post I am going to share my personal action steps for beating body checking – see you there!